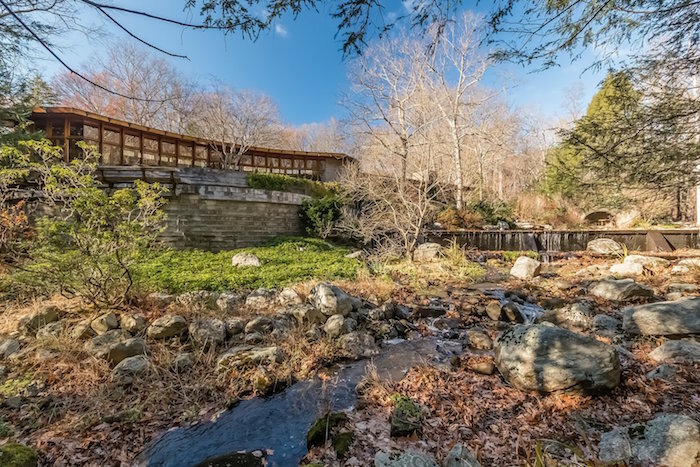 Located in New Canaan, Connecticut on a 15-acre piece of wooded land that looks over the Noroton River, 432 Frogtown Road was first built for Joyce and John Rayward and has only been in the hands of two other owners. 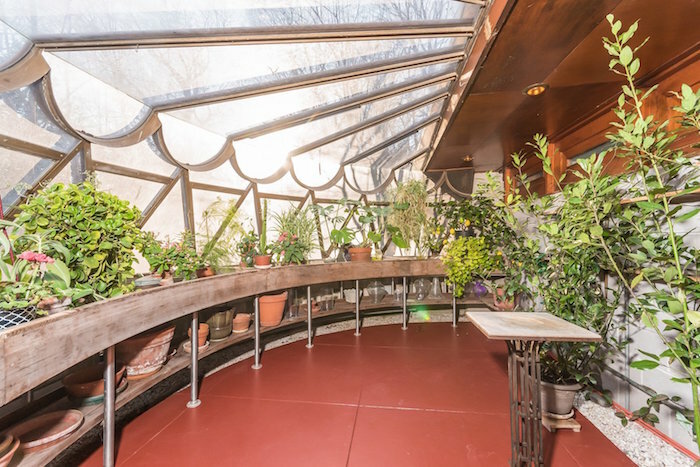 Also known as the “Rayward-Shepherd House” or “Tirranna,” Wright designed this spectacular home during the last years of his life while he was completing the Guggenheim Museum in New York City. Only four years after the house had been built, the Raywards commissioned Wright’s firm to return and complete a massive extension that would be based on his original designs. 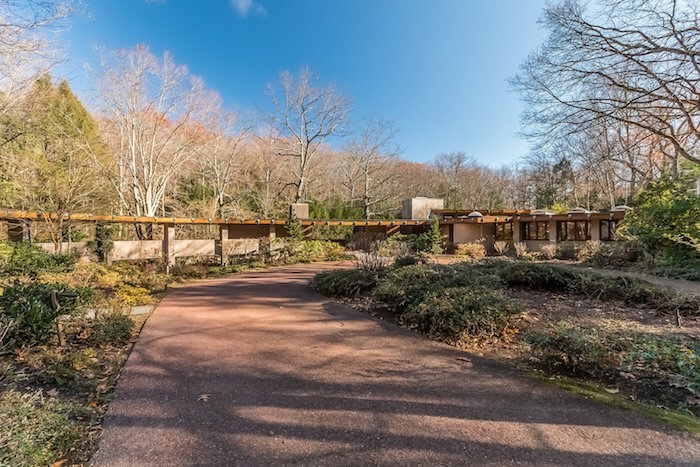 So, William Wesley Peters and Taliesin Associated Architects ended up expanding the house after Wright’s death in 1959, which included a new bedroom wing, greenhouse, central garden, covered walkway, and a caretaker’s quarters. Jim Gricar of Houlihan Lawrence explains that even though these additions expanded the residence enormously all of the same materials and finishes were maintained from the first round, making it a seamless update. 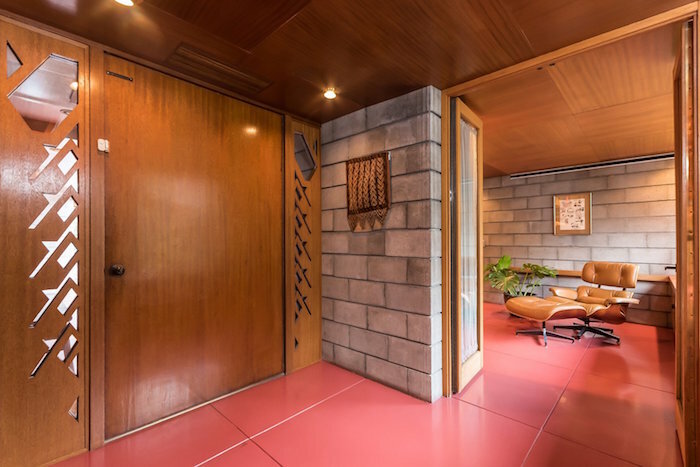 The interior of the home is almost completely lined with mahogany, along with sections of concrete blocks. Wright’s design called for different cuts of wood to be placed together, which creates a rich layered effect. 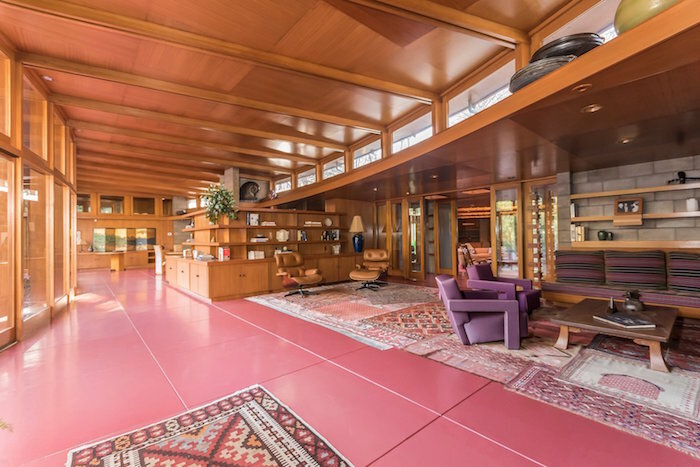 The red flooring that runs throughout the interior is Colorundum in Cherokee red, a color Wright loved to use in his projects. Jim Gricar of Houlihan Lawrence explains that the flooring is made up of a series of minerals that have a low freezing point, which makes it difficult to crack. 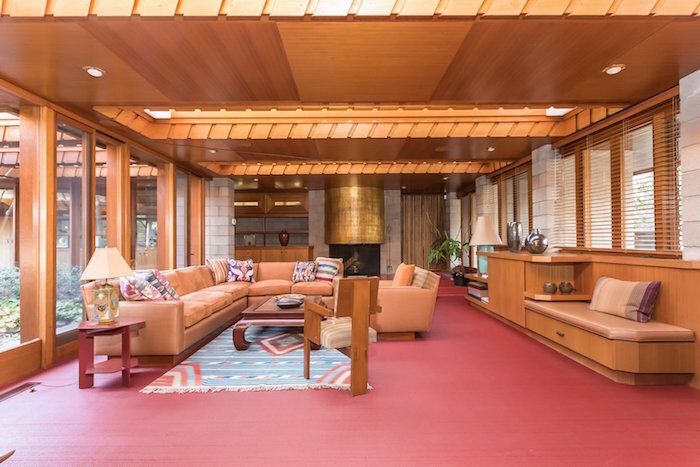 The original living room holds a number of furniture pieces that Wright designed. Since he enjoyed interweaving textures and materials, he created a fireplace that’s made of concrete block—but painted with gold leaf. 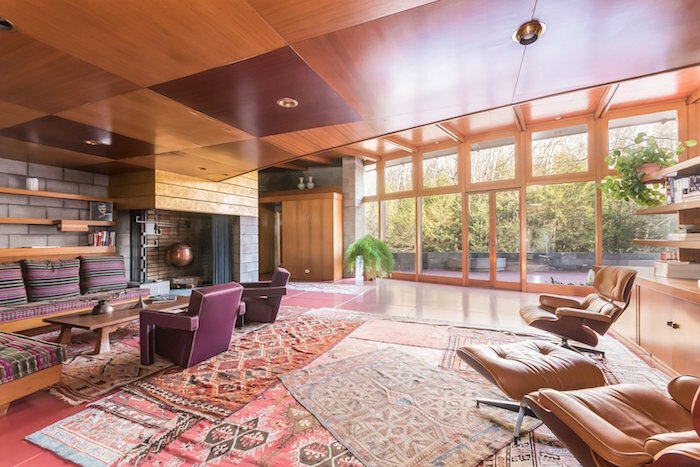 In the family room—which also holds a gold leaf-covered concrete fireplace—large skylights run the width of the space. 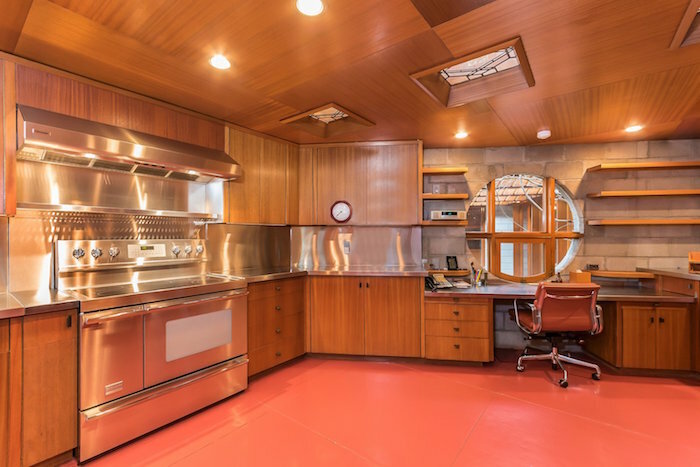 Though the appliances have been updated, the rest of the kitchen is original, including the cabinets, piano hinges, and the painted glass windows on the ceiling. 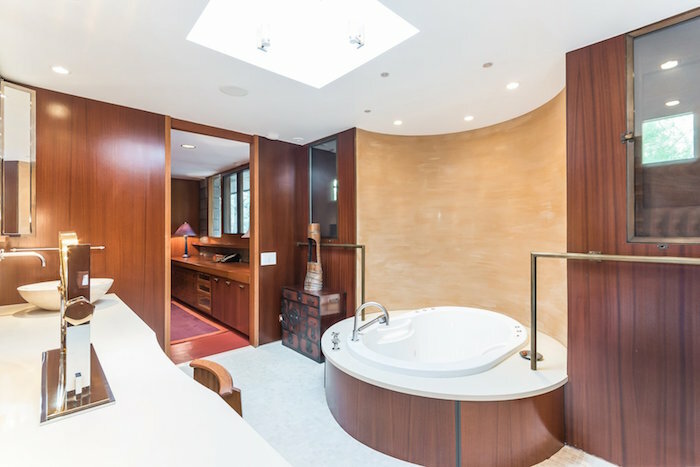 Shown here is one of the double master bathrooms, which holds a new tub that sits in front of a painted plaster wall. The layout and mahogany panels have remained original. 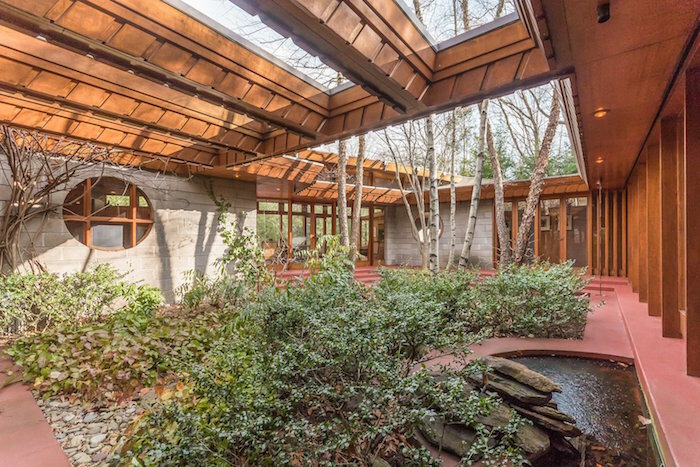 Since Wright was consistently focused on nature, he built an internal courtyard that creates a peaceful retreat in the middle of the structure. The greenhouse features windows that are finished with a scalloped metal treatment. 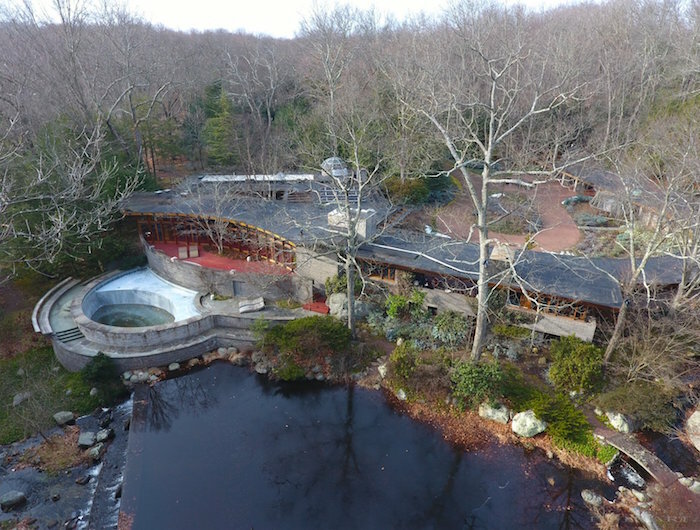 An overhead drone view shows the 15-acre property that also hosts a heated pool, river, tennis court, barn/stable, sculpture path, and rooftop observatory. The original landscaping was designed by Frank Okamura and Charles Middeleer.